The Epson Stylus Photo PX720WD is all in one inkjet printer suitable for creative projects and to get lab quality photos. The printer has a good design and has a 6-ink colour cartridge system. It measures 446 x 458 x 150 mm and weighs 9.6 kg. It features standard Wi-Fi connection and duplex printing features. It supports direct DVD or CD printing as it comes with a built-in tray. The touch panel controls are intuitive that makes it user-friendly. The colour screen is built into the printer which is of size 6.3cm. This screen makes it possible to preview pictures. It has a memory card slot, PictBridge port and 2400x4800dpi CIS scanner. In normal mode, black text speed varied between 6.3ppm and 8.0ppm, depending on the length of the document. The printer has built-in Wi-Fi, supports high-definition printing, and has a smart navigation touch panel. The normal-quality text with Epson Stylus Photo PX720WD Ink Cartridges is good enough for occasional use. Colour graphics are fine with smooth fills and the photo prints are also very good. The Epson Stylus Photo PX720WD is built specifically for creative and colourful projects. Users who are looking for a decent photo printer that lets them print directly from their digital devices, can find it a good choice. The Epson Stylus Photo PX720WD Ink Cartridge technology used in the printer allows home users and photographers to get the best high quality prints. But documents being printed on the plain paper may be disappointing. Q. I would like to purchase Epson Stylus Photo PX720WD Ink Cartridges. Do you deliver your products to Cork? A. Yes, we deliver to all areas of Republic Ireland and Northern Ireland. Q. What types of memory cards are compatible with the Epson Stylus Photo PX720WD printer? A. The memory card supported by this printer are Memory Stick Duo™, Memory Stick PRO Duo™, Memory Stick Micro™ with Adapter, MultiMedia Card, MultiMediaCard Plus, MultiMedia Card mobile with Adapter, SD Memory Card, mini SD with Adapter, micro SD with Adapter, SDHC Memory Card, miniSDHC with Adapter, micro SDHC with Adapter and SDXC Memory Card. Q. When should I undertake cleaning of the print head of the Epson Stylus Photo PX720WD printer? A. Since print head cleaning consumes some ink from all cartridges, you should only undertake it when the print quality declines. Q. Can the Epson Stylus Photo PX720WD printer print on CDs and DVDs? A. Yes, this printer has a dedicated tray for printing on CDs and DVDs. Q. How much ink is supplied in each of your compatible Epson Stylus Photo PX720WD Ink Cartridges? A. The ink volume of the black cartridges (T0801 Black) and the colour cartridges (T0802 Cyan, T0803 Magenta, T0804 Yellow, T0805 Light Cyan, T0806 Light Magenta) is 13 ml each. Q. What are the differences between original and compatible ink cartridges? Is there any risk in using your compatible Epson Stylus Photo PX720WD Ink Cartridges instead of the original ones? A. Our compatible Epson Stylus Photo PX720WD Ink Cartridges are much cheaper to purchase compared to the original Brother cartridges. Furthermore, our compatible cartridges are more environment friendly as they are made from recycled cartridges that were used previously resulting in very little usage of new materials or components. There is absolutely no risk in using our compatible cartridges. These are FSC tested products and come with a money-back guarantee, thus ensuring the quality. Q. 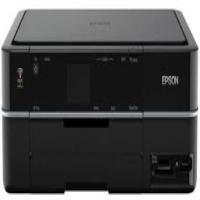 Where can Epson Stylus Photo PX720WD ideally be used? A. The Epson Stylus Photo PX720WD printer was specifically built for creative and colour projects. It is capable of printing high quality photos and the user can print photos directly from their camera or memory card. This printer is recommended for photographers or those who require high quality images, but text quality may not be as satisfactory. Q. What are the dimensions and weight of this printer? A. The dimensions of Epson Stylus Photo PX720WD printers are 446 mm x 458 mm x 150 mm and they weigh around 9.6 kg. Q. I am a photographer who requires high quality prints. However, buying original cartridges for my printer gets too pricey. Can I use compatible Epson Stylus Photo PX720WD ink cartridges instead of original ones without compromising on quality? A. Yes, absolutely! You do not need to worry about compromising on quality with our compatible Epson Stylus Photo PX720WD ink cartridges since they are all FSC tested and certified. Q. What operating systems do Epson Stylus Photo PX720WD printers support? A. Epson Stylus Photo PX720WD printers work well with all versions of Mac and Windows operating systems. Q. What kinds of paper can I use with this printer? A. You can use Legal paper, Letter paper, 16:9, 20 x 25 cm, 13 x 20 cm, 13 x 18 cm, 10 x 15 cm, 9 x 13 cm, envelopes, B5 size paper, A6 size paper, A5 size paper and A4 size paper with Epson Stylus Photo PX720WD printers. Q. I have an old Epson Stylus Photo R285 which I no longer use. However, I was wondering if I could use the ink cartridges from the R285 with my PX720WD. A. Epson Stylus Photo PX720WD ink cartridges are the same as Epson R285 ink cartridges. You can use the ink cartridges you previously used with your old printer with the Epson PX720WD without any hassle. A. You can use the CD-ROM that you got with your printer or you can download the printer drivers from here. Q. Will compatible Epson Stylus Photo PX720WD ink cartridges work fine with my printer? A. Absolutely! Our compatible ink cartridges are 100% quality certified and we assure you that you will face no problem while using our compatible ink cartridges. They will perform as well as the original ink cartridges.